At almost every turn, science and medicine reveal a new “superfood” that will dramatically improve our health. Chia seeds can reduce your cholesterol. Green leafy vegetables burn belly fat. Blueberries boost your antioxidants. Now, the latest in wonder snacking – celery seeds to lower your high blood pressure (HBP). But does it really work? “It’s no secret that plants offer vitamins, minerals, fiber and antioxidants to help you maintain good health, but it’s a mistake to think you can eat only those substances as supplements and really get the same benefits,” according to Kenneth Shafer, MD, Department of Cardiovascular Medicine. A plant’s isolated nutrients and other compounds work together to improve health, but we don’t really know why or how they do it. 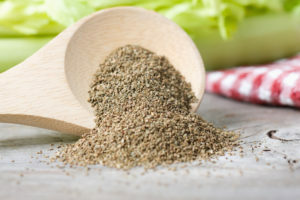 A recent study did find that taking celery seed extract improved BP levels in patients who had mild to moderate elevations. But for the most part, research indicates taking plant extracts offers little to no benefit and can sometimes cause harm. 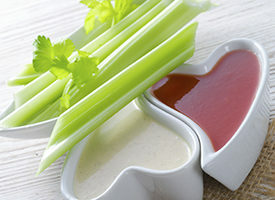 “For this reason, it makes sense to simply eat the whole food, including celery,” Dr. Shafer says. Your BP measures the force your heart exerts to pump blood around your body. The higher your pressure, the harder your heart is working. If your pressure is high enough, it can damage your blood vessels, as well as your heart, kidneys, eyes and brain. It can also put you at greater risk for coronary heart disease, stroke, heart failure and blindness. “Any BP over 140/90 is considered high, but if you have diabetes or chronic kidney disease, keep your levels below 130/80. Limiting your sodium intake to below 1,500 mg can help control your BP,” Dr. Shafer says. Celery contains a phytochemical called phthalides. As an extract, it’s called NBP, and it relaxes the tissues of the artery walls to increase blood flow and reduce blood pressure. Eating the whole food, though, is better. Celery stalk salt content is low, and you also get fiber, magnesium and potassium to help regulate your blood pressure, as well. 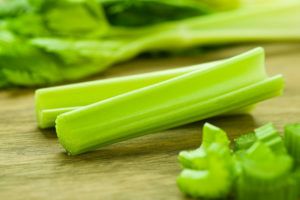 “To get the benefit, you should eat roughly four stalks – one cup, chopped – of celery daily,” Dr. Shafer says. Celery alone won’t bring down your BP. Most major health organizations, including the Cleveland Clinic and the National Heart, Lung and Blood Institute, recommend the DASH Diet, a nutrition program targeted at lowering BP and the risk of cardiovascular disease. “A diet based largely on plants is ideal,” Dr. Shafer says. By eating vegetables, fruits, whole grains, beans, seeds, nuts and vegetable oils, you get the potassium, calcium, magnesium, fiber, protein and limited sodium needed to control your BP. You should also restrict sweets, sugary beverages and red meats.